Benjamin "Ben" Helix was born in 2339 in New York, NY. He is the oldest of seven boys and the only one to enter Starfleet Academy. Ben majored in engineering and did not select a minor. He never had the desire to command a starship only wanting to be an engineer much like his hero Montgomery Scott of the Constitution class Enterprise. After graduating the Academy Ben was assigned to the Ambassador class USS Yamaguchi as an engineer. Shortly after arriving on the ship he was put in charge of the Gamma Shift. 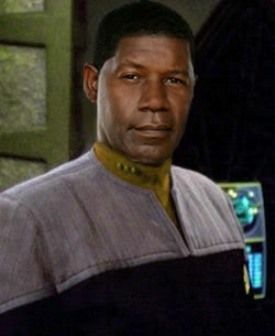 He was then transferred to the Excelsior class Okinawa to be the Assistant Chief Engineer before ending up on the Tian An Men where he met Derek Rothchild. The two men became best friends with Rothchild serving as best man as Ben's wedding in 2369. When Derek was offered command Ben said he would transfer with Derek so long as Derek never tried to force the Second Officer position on him. Despite Sean Hawk taking over the Second Officer in 2378 Ben was still promoted to Commander for his exemplary work.